…I mean, what needs to be said? It’s old-fashioned Pokemon Catcher with 2 copies, it only came out a month ago, and it’s already having a tremendous impact. It’s not even the only card on the list that’s from Lost Thunder! That’s how impactful this set was! But in any case, make sure to keep your copies handy – this card’s likely to be as big a staple as Puzzle of Time was! …but not like Missing Clover. Arora Notealus: I can’t even say, “Oh hey look at the impact this card has had since it came out.” But still, there’s something about these 2-for-1 cards that somehow is appealing to a massive level. It probably helps that we’ve got the Lysandre/Pokemon Catcher effect, which has historically proven to be powerful, and it doesn’t have to compete with Guzma as a Supporter, so that’s more good news on this card’s end. On the face of it, when this card was revealed, it seemed like a four of, and I’ll admit, aside from the brief fourteen games I tried with it back in November, I haven’t used it in a deck since. I went 7 W 3 L with it in a Lost March build, but I went 1 W 3 L with it in a Zeraora deck. Records aside, though, I found I just wasn’t using it. Oranguru gives you the same effect every turn its in play, and Pokemon Catcher would be the superior choice because statistically it’s an equivalent percentage and you don’t have to have two Pokemon Catchers in hand at the same time to use it. I know Pokemon Catcher and Custom Catcher aren’t apples to apples, but they’re similar enough to make the comparison. 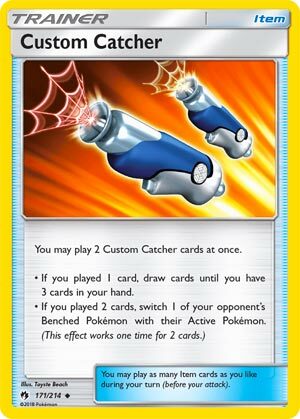 Unless you’re using Alolan Ninetales GX, it’s tough to get two Custom Catchers in hand at the same time. More importantly, records and statistical percentages aside, I found that I just wasn’t using the card. Guzma and Oranguru get used very frequently. In a spread deck I’ve been playing recently, Oranguru hits the bench more than fifty percent of the time, and I played the single Guzma I carried in the deck in almost forty percent of my games. Custom Catcher just wasn’t seeing those same play rates. Cards that are four ofs in a decklist should rarely go without being played at least once; in my testing – and granted I should probably test it more – there were several games where I didn’t play Custom Catcher a single time. Sorry, but that just says to me that, while well intentioned, this card just isn’t worth the slots it takes up in a sixty card decklist. Like I said, this card probably deserves more attention than I’ve given it, and there are probably decklists that would work better for Custom Catcher than the Zeraora and Lost March lists I tried it in. I just think that the alternatives to this card – Oranguru and Guzma – are both more effective than Custom Catcher. Our 9th place pick is another runner-up card from a certain expansion: Custom Catcher from Sun & Moon Lost Thunder, which was the second best card of the set. This is a card which has two different effects depending if you’re willing to play a single copy or play two copies at the same time. If you played one copy, then you draw cards until you have three cards in your hand. If you play two of them at once, then you choose one of your opponent’s Benched Pokemon and switch it with their Active. I’ve mentioned before that you would either run a full four count or not at all because if you rely on putting just two instead of three or four, then you may risk getting one of them prized. And although you get to reap the effects of Lysandre and still use another Supporter card, you have to have two of them in your hand. If for some reason you badly needed two Custom Catchers in your hand, then Order Pad might help you to some extent if the coin flips cooperated. Another aftermath is that if you did reap the effects of Gust of Wind, then you have just given an opposing Garbodor whose Trashalanche attack gets boosted by 40 more damage. Item lock might not be as prevalent, but it still is in Expanded because of Seismitoad-EX and Vileplume AOR with Irritating Pollen. Ultimately, it comes down to personal preference in terms of picking your potion. There are other cards that do a similar job but has their own set of advantages and disadvantages. Some decks can cope with it and some won’t. I had this as my personal 4th place pick of the best cards of 2018. Notes: When one isn’t enough, using two of them with both your hands is productive enough. Next up: This one can evolve into…anything! We’re counting down the Top 11 Cards of 2018 sitewide! We normally end the year with a Top 10 countdown, but as December 31st is a Monday, it just seemed like a good idea to add in one extra slot and end the year exactly with our first place pick. We’re a little ways from that, however, as we are only looking at our ninth place pick today, Custom Catcher (SM – Lost Thunder 171/214, 231/214). This Trainer-Item gives you the option of playing two copies of it at the same time, which radically alters its effect when you do. If you use a single copy of Customer Catcher from your hand, it lets you draw until you have three cards in hand. If you play two down at once, it lets you select one of your opponent’s Benched Pokémon and promote it to the Active position (forcing the previous Active to the Bench). This actually was our second place pick when we counted down the Top 11 Cards of SM – Lost Thunder. Note: I did finally go back and score Custom Catcher earlier today, as I had to post the review without one at the time. I haven’t been linking to past reviews too much so far. I’m also haven’t been stating my personal ranking a card received, or its voting point total, etc. I’m still not going to get into all those details, but I don’t have much to say about Custom Catcher because it didn’t make my own list. It didn’t make my own list because it isn’t making too many of the successful decklists I’ve seen… or at least, that I can easily Ctrl+F to search. I’m not testing as much as I’d like, I’m not playing as many Standard or Expanded Format matches as I’d like, and I’m not even as well read as I’d like when it comes to tournament results. The holiday crunch is affecting me as well as most of my information sources, simple as that. With what I do have, however, Custom Catcher is barely showing up. Of course, so are some other cards I regularly here discussed as being highly competitive, or which I do encounter frequently even with my infrequent Standard and Expanded Format play, so I cannot rule out that Custom Catcher is one of those, hiding in the gaps. to do the job, and that’s just off the top of my head. Well, I did need to look up the Set/Card # for Lycanroc-GX. I am pretty sure there are a few more out there, but for sure Guzma and Lycanroc-GX are seeing successful, competitive play right now. Counter Catcher has shown up in some winning Zoroark-GX Control decks, as well. Pokémon Catcher isn’t too common, but I think it sets a good baseline for what these kinds of effects have to outclass to see real competitive play. While it requires a coin flip, and two copies of it won’t guarantee success, one copy still has a chance to fake being its pre-errata self while a single Custom Catcher can only be used as draw power, and even that is only when your hand is small enough. If a deck isn’t running something like Alolan Ninetales-GX (SM – Lost Thunder 132/214, 205/214, 225/214), getting the two copies of Custom Catcher in hand at a time when you need their gusting effect is harder than I anticipated. It isn’t impossible, but I didn’t find several of Top 8 decks running Custom Catcher, even when those same decks were running Alolan Ninetales-GX. With its particular method of Ability-based draw, Zoroark-GX decks would seemingly lend themselves to Custom Catcher but – again – not too many lists I saw were bothering with it, sticking instead with Counter Catcher, Guzma and/or Lycanroc-GX. So, it doesn’t look like Custom Catcher is all that in the Standard Format. It isn’t a bad card, it just is doing something that multiple other cards do about as well or even do a little better. In the Expanded Format, the same applies except we’ve got more potent Ability-lock and Item-lock strategies, something Custom Catcher doesn’t like, overpowering the additional draw/search/recycling options that would otherwise improve Custom Catcher’s use. Still a must-run in the Limited Format, but be aware that is because it is a bit of draw power you might be able to use but be aware that is due to the nature of Limited Format play, running what you pull, and not because it is super likely to enact a power play. Hands get cluttered easily in Limited Format play, and you aren’t likely to have a way of searching out a second copy for the second effect. 2018 was not a great year for Custom Catcher, other than us overrating it in our first review, that shouldn’t be too much of a surprise. All of the SM – Lost Thunder cards carry the mixed blessing of being the most recent in our minds but also had the least time to affect 2018, bar some last minute promos. Custom Catcher still has hope; next year, especially post-rotation, it still has a lot of potential. Just not enough that I thought it was worth a place in our Top 11.